There’s nothing quite like the funky, earthy stench of a dog who’s just walked in the rain or gone swimming in a lake. We can’t grab a towel fast enough, am I right, pet parents? 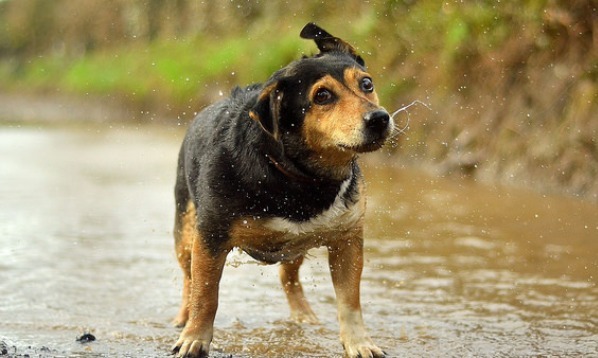 That wet-dog odor is caused by microorganisms that live in dogs’ hair, according to Compound Interest, a website that takes a closer look at the chemical compounds people come across every day. The site and its infographics were created by Andy Brunning, a chemistry teacher in the U.K. When water is added to the microorganisms in a dog’s hair, the foul-smelling organic compounds they produce are able to break free. As the water evaporates, the compounds increase in the air, as does the odor. Brunning notes that, “perhaps unsurprisingly,” few studies have been conducted on the source of wet-dog odor. 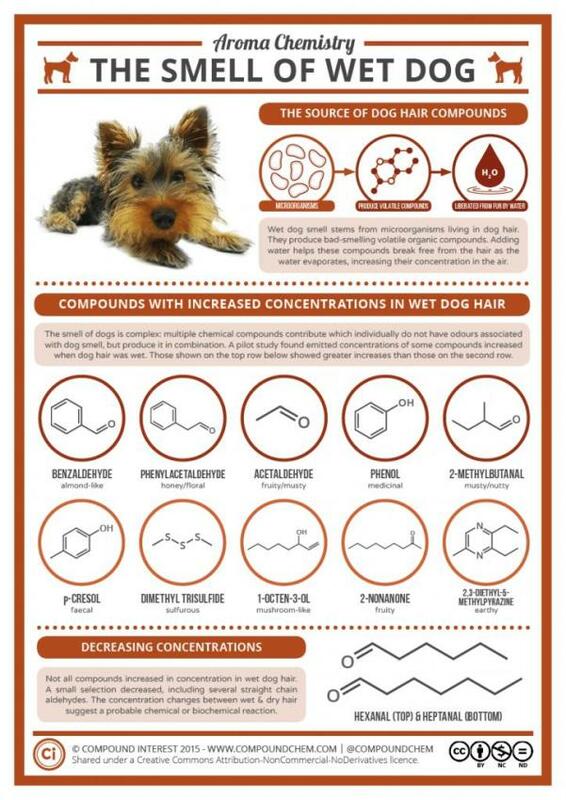 A study several years ago identified several compounds whose concentrations increased when a dog’s hair was wet. According to Brunning, additional research is necessary to authoritatively identify the chemicals causing the foul wet-dog odor. “Until then, we at least know that it’s not the dogs themselves we should be blaming for smelling terrible, but rather the microorganisms they carry,” he concludes. To help prevent wet-dog odor, pet parents can regularly brush and bathe their dogs to remove some of those microorganisms, advises Dr. Mary Fuller on VetStreet.com. If your dog smells funky even when he’s dry, Dr. Fuller says to take him to a veterinarian. A foul odor can be a symptom of a skin or ear infection, periodontal disease, digestive issues or other health problem. Next up, I hope Brunning creates an infographic that explains why dogs’ paw pads smell like corn chips.